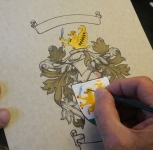 Your ancestry gets the royal treatment, with the authentic coat-of-arms for your family surname painted by hand on majestic premium parchment measuring 22”h x 16”w. 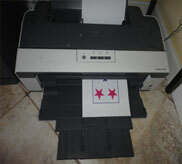 Matted in royal blue and framed in a gardwood grame with linen liner. 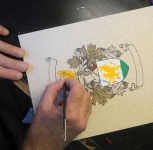 The large shield spotlights your hand-painted coat-of-arms, crowned by an ornate medieval helmet as the foundation for your family crest. 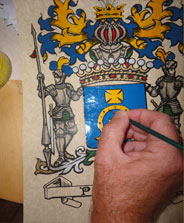 Two medieval knights stand guard at either side of the shield, their armor shining with metallic inks. 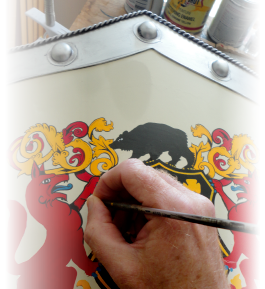 Vibrant enamels and masterful craftsmanship bring your coat-of-arms to life within the shield, while your family surname is hand-painted at the base, for a look that lasts for this generation and the next.